Dynamic Investment Theory (DIT) sets the logic and rules for the creation of a new investment type called Dynamic Investments (DIs). DIs are a unique investment type in the market. They are capable of identifying and capturing the positive returns of uptrending asset and market segments wherever and whenever they exist in the market. DIs are the financial world's first market-sensitive investments that can be easily implemented and managed by the investing public. With their introduction, the world of investing changes. The following diagram shows the very simple structure and components of all Dynamic Investments. Each is explained below. Dynamic Equity Pool (DEP) - This is where a DI designer places groups of equities (Exchange Traded Funds -ETFs- or Mutual Funds) that are “candidates” for purchase by the DI at a Review event as discussed next. Price Trend Indicator - This is the technical indicator that NAOI testing showed to be the most effective for ranking the ETFs/Funds in the DEP by price trend. Trailing Stop Loss Order- A Trailing Stop Loss order is placed on the ETF/Fund purchased by the DI to protect its value from sudden and significant price drops during the short time it is held. Each of these components is a variable that is defined by a DI designer to meet specific investing goals. The NAOI provides training classes for DI Designers as discussed on Slide 13. DIs are a comprehensive investment type that not only specifies the equities to work with but also how they are too be managed on an ongoing basis. 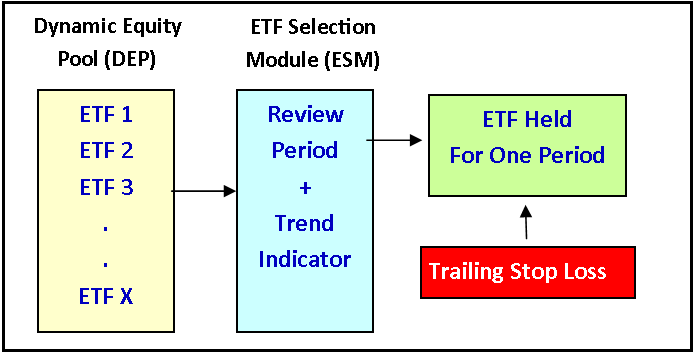 The following diagram illustrates how a DI can change the ETF it owns based on a quarterly sampling of the price trends of a Stock and a Bond ETF. The DI management process strives to hold ONLY uptrending equities while selling, or avoiding, those that are trending down. This is in stark contrast to MPT portfolios that are designed to hold both winning and losing equities at all times. The simplest possible DI - the NAOI Core DI - holds only a Total Stock and a Total Bond ETF in its DEP. It produced the returns shown in the top row of the Table below for the volatile period from 2008 to 2018. The bottom row shows, for comparison purposes, the performance of a traditional MPT portfolios with a 60% allocation to Stocks and a 40% allocation to Bonds. The Sharpe Ratio shown in the last column is a measure of how much return was obtained for each unit of risk taken and the higher the better. You can easily see that the performance of the DI, using the same ETFs as the MPT portfolio but with the DIT management style, is simply stunning and it is real. Today’s financial “experts” will say that returns like those produced by the Core DI are impossible. And they ARE impossible using MPT methods. But we have moved out of that outdated world into the new and updated world of DIT. Here returns of this magnitude - without increased risk - are not uncommon. The higher returns and lower risk of Dynamic Investments give them the potential of dominating the future of investing. They can be held as standalone portfolios or used as building blocks in an MPT portfolio as discussed on the next slide.